As a sector of indisputable importance to the nation, the tea industry draws periodic comments and now seems such a time. The various assessments and comments are naturally, not wholly acceptable. In fact, my long held view is that the assumed profitability of the industry is spurious. There is the peculiar phenomenon that while most of the estate operations report losses, the industry as a whole is said to be profitable. This is either bad arithmetic or superficial – for how can the whole exceed the sum of the parts? I believe that part of this puzzle derives from the fact that the production and marketing arms display contrasting profitabilities. No plans or projections are valid unless this fundamental feature is recognised and accommodated. The conflicting opinions in the ongoing debates are perhaps supporting evidence. Salient observations are that the smallholder sector is the larger contributor to production but now seems to be in slow decline. The estate sector, which was a gold mine in its heyday, began its decline earlier and is now in much more chronic trouble. Many reasons are ascribed and quite a few remedies proposed. Oft heard prescriptions for remedying the malaise of the industry entail phrases such as “increased productivity”, addition”, “vertical integration”, “niche markets” and other fancy bits of vocabulary. A practical approach has to recognise the two sub-sectors – production and marketing. The first could entail all processes up to dispatch from our shores, while the latter takes over from there up to the final consumer. The “value addition factor” – basically blending, flavour addition and packaging would be an interface. As long as the State Sector in the guise of The Tea Propaganda Board was in charge of foreign promotion, the usual mixture of laziness, profligacy and waste ensured limited impact – certainly inconsistent with the fanfare and cost. Once the private sector chose to engage more purposefully, the rewards surely followed. This was due to marketing skills, proper prioritisation and adaptation to the real world! A large part was also the canny perpetuation of some handy myths! The usual recipe for productivity increase entails replanting and adoption of recommended agronomic measures (for example, draining, forking, fertilising, pest control, plucking and pruning). Critical examination of the effects of almost all these practises will make it difficult to entice growers to adopt them and I challenge anyone to provide incontrovertible evidence of adequate returns from the recommended practices. Replanting with clonal tea may be an exception but only superficially so. The manthram of “statistical probability” when applied to agriculture is perhaps a curse. While of some use to researchers, it is grossly erroneous for one to believe that it impresses investors and growers A ten- or five-fold increase will be more like what they want. I repeat my challenge to researchers to show unequivocal evidence of benefits of similar magnitude by the adoption of recommended practices. Some decades ago, there was a massive World Bank input called the MTIP. Its major hopes were pinned on replanting, infilling and improvement of workers’ living conditions. I presume that we are now well in a position to evaluate the benefits against the incurred costs of that venture. Of course, in the formulation stages, attractive expected “rates of return” would have been forecast! I for one would be reassured by access to any reliable analyses to show the cost to return benefits of this massive endeavour. I have recently seen a figure of some Rs 2 million to replant and bring into bearing, a hectare of tea. When, if ever, can a grower expect to cover this investment (inflation and opportunity cost included)? I believe that the honest answer is “never”! The much hyped “value addition”, I believe entails mixing teas (blending) flavour addition and packing into tea bags. This is hardly indicative of potential, imaginative innovation and high technology! There is demonstrable evidence that the marketing process, is in contrast to production, highly lucrative. There is not much evidence however of significant “vertical integration” or profit sharing. Since a product has to be available to be marketed, long term viability has to ensure progress of production and marketing in tandem. Retail value of tea is very much a function of tasters’ judgement – by sensory evaluation. This is a fascinating area. It is riddled with so many puzzles that it has to be magic or a skillful hoax! But this is a whole vast subject peppered with unaccountables! Like many an article of faith, it has continued without critical evaluation. One promising opportunity for “value addition” is to venture into the iced tea market during the Summers in sophisticated markets. If purposefully pursued with linkages with established firms to use Sri Lankan teas while providing brewing, packaging, refrigeration and retail arrangements, the partnerships could be mutually rewarding. In the production sector, the reported decline in smallholder yields, which are currently estimated to contribute some 60 to 70% of national production, cannot be ignored. An attractive hypothesis is that many of these holdings earlier constituted part of a “crop mosaic” in mixture with rubber, home gardens etc. They therefore possibly started off on soils of acceptable fertility. But being prone to rapid degradation under the wetter and hotter climate, have presented the problem rather more quickly than higher elevation plantings. This can easily be checked. Prolonged cropping practices with artificially forcing inputs and inordinate exposure of soil to rain and sun, are not the stuff of prudent Tropical Monsoonal land husbandry. Remembering that Tropical Rain Forests are among the most productive natural communities, the environmentally soundest options would simulate them. Hence timber, rubber and cocoa are not as debilitating as tea. “Strip cropping” or the Indian system of “Multiple Canopy farming” or the Philippine development of “SALT” technology take account of this reality and may be practical models for emulation. If rotational systems are the choice, the cycles should be perhaps of the order of 25 years and not the wishful two years or so of Guatemala grass! 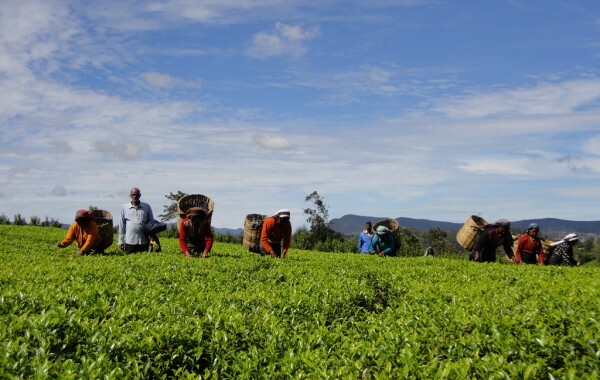 A recent BBC feature suggested that Sri Lankan tea is in dire trouble because the major markets of Iran, Iraq and Syria are all in political turmoil. One hopes that the powers that be are conscious of the possible consequences. Unfortunately any attempts to highlight the weaknesses of the tea industry are shouted down as efforts to recklessly dismantle the “Goose that lays Golden eggs”. Such is certainly not the present intention, but it is rather an effort to draw attention to the need for prudent evaluation and to draw away from misleading slogans and distorted “statistics”. As a practical strategy, the maketing sector is well left alone. It must however recognise that a healthy production sector is essential for sustained progress. It should also remember that the highly subjective sensory evaluation is a weakness – that may collapse as easily as it has subsisted on tradition and convention. Tea is not exactly a commandingly vital commodity. The production sector is probably facing an urgent need to restore soil fertility. This is a slow process with no shortcuts. It is wishful thinking to expect two years of grass to remedy the burdens of a century of misuse. Nature’s way of restoration is through rotation. A sensible cycle may be as long as 25 years. Options available range from a reasoned replacement of selected areas, through interplanting with fuel/timber/shade species and even a “resting” of the tea itself with the facility of bringing it back to leaf production if warranted.